Whatcha doing this Pre-Halloween Weekend? I've been hanging out over at the new Artisan Whimsy site. It's a site that was started by some wonderful artisan ladies after the Creative Bead Chat over on FB got to be so successful and people asked for something more. Artisan Whimsy is loaded with all sorts of fantastic information for creative bead/jewelry minds,...videos how to's, tutorials, jewelry inspiration and ideas, forums and chats, challenges and give-a-ways, events, and fun and informative blog posts. One of those blog posts is where I learned to pin my own MiShel Designs Etsy items onto Pinterest and then create a set with it over on another favorite site of mine, Polyvore. I had figured it out a while back and forgotten how to do this and then when I had tried it again, it was like I'd never done it in my life, so I desperately needed my hand held and told step-by-step what to do! 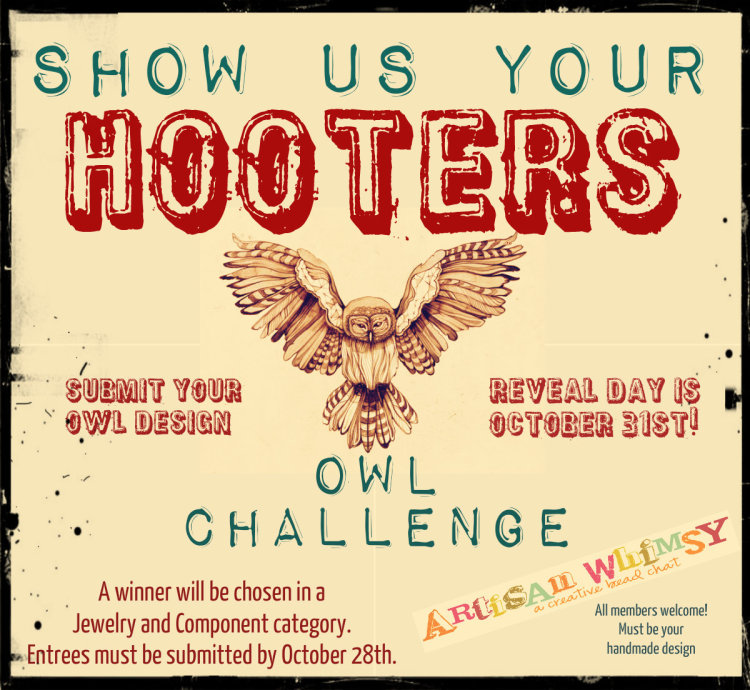 "Show Us Your HOOTERS" Challenge. Nope, not those kind of hooters,...owl Hooters!! Go on over and check it out. You've got until the 28th (tomorrow) to enter I think it is. And, if you've recently added some cool things to Pinterest, why not leave your link or follow me and give me a 'head's up' on what's going on over on your favorite boards! Peace, Love and Saturday Night Spotlights! Precious. I'll take the second set. What a beautiful board! I sure need to take the time to learn to do this one day too!